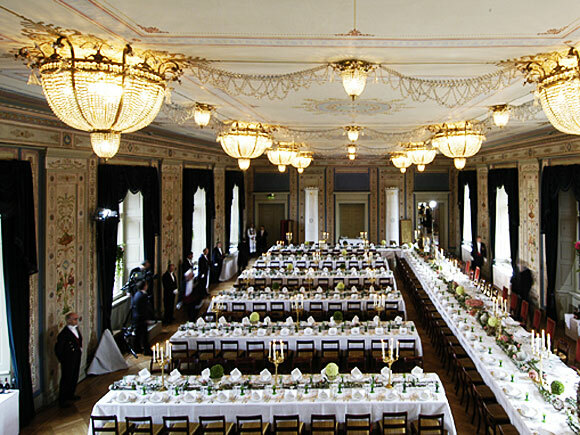 The hall is used for banquets in connection with state visits and other important occasions, as well as the annual banquet for the members of the Storting (national assembly). The banquets follow certain traditions. Royalty and their guests enter the hall to the notes of Gammel Jægermars (The Old Hunters March) by the Norwegian composer Chr. Schjølberg. Speeches are announced by the striking of a great brass bell, a gift from the Oslo Firemens Corps to King Haakon VII for his 80th birthday in 1952. Banquets usually have four courses, all of which are based on Norwegian ingredients. A banquet generally lasts three hours, and the royal procession leaves the hall to the tune of Valdresmarsjen (The Valdres march), by the Norwegian composer Johannes Hanssen. The Banqueting Hall measures 300 square metres, and building costs were estimated at 1,500 rix-dollars, or one-eighth of the cost of the Great Hall. Palace architect Linstow decided that the decoration should be simple, because even though the distance between floor and ceiling is 5.7 metres, it appears less to guests entering the Hall from the Ballroom where the ceiling height is almost 11 meters. In order to produce a splendid effect at little cost, in Linstows words, the artist Peder Wergmann was commissioned to decorate the hall in the Pompeian style. Linstow felt that this style had richness of expression without requiring too much preparation, since it could be painted directly onto the walls. Both here and in the Family Dining Room, Wergmann collaborated with August Thomsen, who was responsible for the figurative representations. 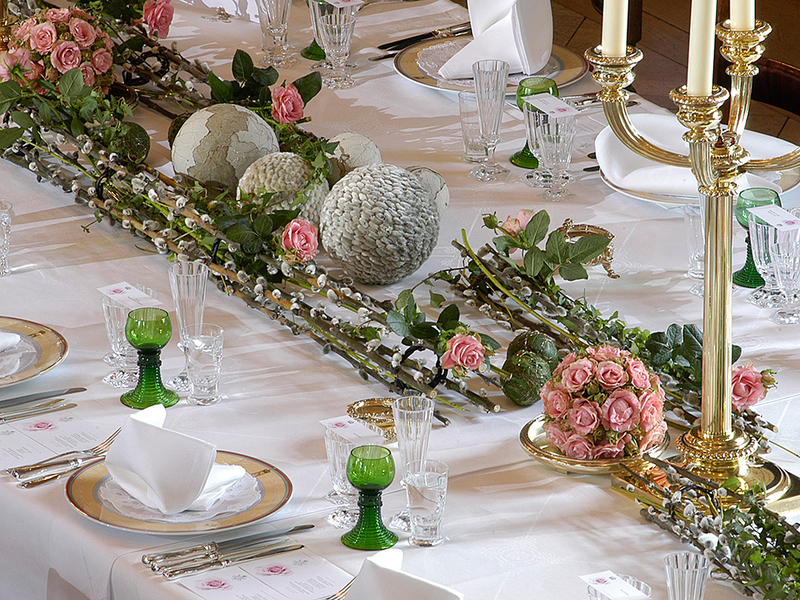 The style of the Banqueting Hall is light and elegant. The wall and ceiling are embellished with rosettes, vines and palmettes, and there are several fine centrepieces. The walls also feature a number of Greek gods and goddesses. The first time the Banqueting Hall was used, the guests claimed that the faces of a number of members of Christiania high society were to be found among the goddesses. This was the subject of lively discussion for weeks afterwards. There are no decorations apart from those painted on the walls. The room has diagonal oak parquet flooring, which has replaced the original wooden planks. The Banqueting Hall was renovated in 2009-2010. The colors and decorations were returned to their original light colours. The Banqueting Hall was originally lit by eight glass chandeliers, but these were dismantled and sold at a chandelier auction in 1903 and electric chandeliers were put in their place. During the restoration work on the Palace in the 1990s, the electric chandeliers from King Oscar IIs time were discovered packed in boxes in the attic. These have now been restored to their original places, linked by garlands of glass prisms. The Banqueting Hall can seat 225 people. This is larger than the hall in the palace in Stockholm, in spite of the fact that the Swedish palace has about four times the number of rooms. As part of the restauration work in 2009-2010, new tables and new chairs were designed in classical style. The glassware is by Hadeland Glassverk. 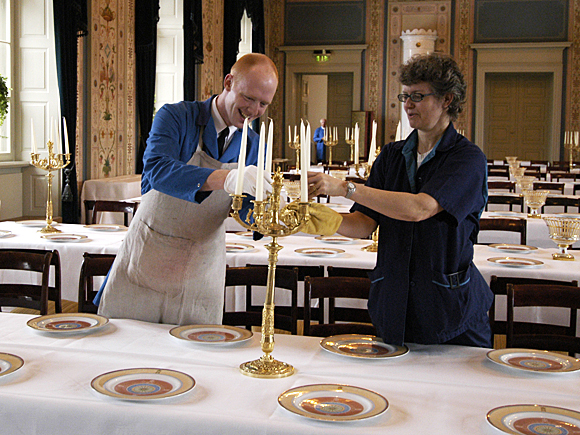 The dinner service was specially made for the Banqueting Hall by Porsgrunn Porselensfabrikk. It was a gift for the King and Queen for their 60th anniversaries in 1997, and the pattern replicates details of the ceiling decorations. The silver was made by Tostrup and Thune in Christiania (as Oslo was then called) at the beginning of the 1860s, and is engraved with the former coat of arms of Norway. The table linen is made of Irish damask and woven to a pattern based on the decorations. It was first used for the state visit of the King of Jordan in April 2000. The table is dominated by tall silver-gilt candelabra, each bearing four candles. These were gifts from the Storting to King Haakon on his 80th birthday and to King Olav both on his 60th birthday and on the 10th anniversary of his reign, in 1967. 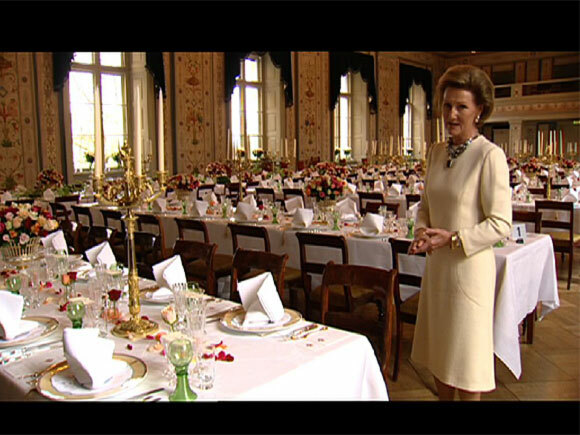 The glassware, silver, dinner service and table decorations reflect the history of the Norwegian monarchy. They are gifts commemorating royal birthdays, anniversaries and other notable events. For example, the first time Queen Maud celebrated her birthday in Norway, on 26 November 1905, womens associations all over the country sent her silver centrepieces, bowls and other objects. Queen Maud also received a table service from the British people on her coronation in 1906. It consists of silver and silver-gilt plates, trays, cutlery, salt cellars, candelabra and copies of the Warwick urn (an urn from Roman times found during the excavation of Hadrians villa, Tivoli, Italy in 1770). The set has since been supplemented, and can now be used for larger banquets. Slottets egne gartnere og blomsterdekoratører står for mange av borddekorasjonene. Foto: Kjartan Hauglid, Det kongelige hoff.